Fairy circles in the pro-Namib desert and iron pentacarbonyl as possible cause - a-bockelmanns Webseite! Iron pentacarbonyl is either of magmatic origin or is formed by reduction of Fe2O3 and reaction with CO. It is volatile and highly toxic. The circles sit on top of columns of water or increased moisture that carries dissolved iron pentacarbonyl to the surface where it kills the grasses. These columns of moisture draw water from their direct vicinity, preventing other columns nearby. This causes the equidistant pattern. 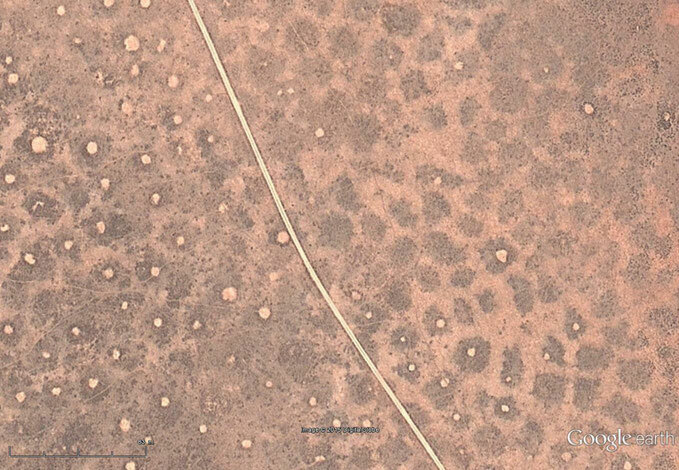 Fairy circles, these round equidistant patches, devoid of any vegetation, have been baffling scientists for decades. The places, where these fairy circles appear, have one thing in common: they only appear in this reddish iron rich soil. This establishes a link to iron. 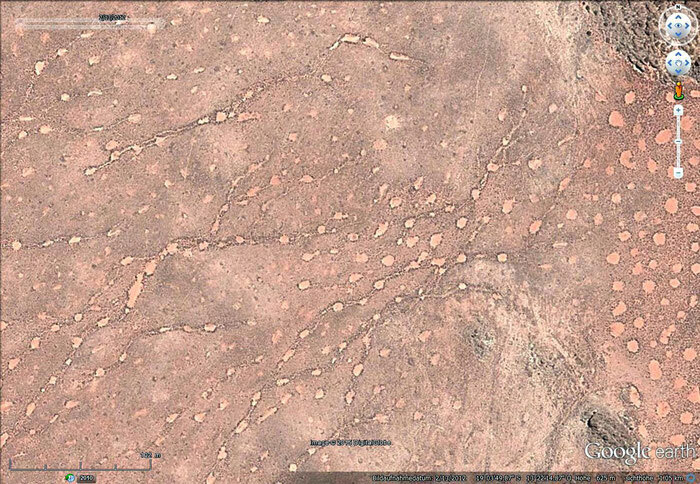 In the Giribes Plain, Namibia, the circles seem to form chains in what seems to be a water runoff on a slope (Fig. 1). This establishes a link to water, as it must be carrying the growth inhibiting agent. Jankowitz et al. (2008) showed with their potting experiment that grasses planted in containers with a closed bottom and placed inside a circle performed well, while those with an open bottom performed poorly. He postulated that a semi-volatile gas inhibited plant growth in the circles. Naudé et al. (2011) found carbon monoxide inside the circles but none in the matrix between circles. Considering all of the above, I suggest that iron pentacarbonyl – Fe(CO)5 - is the growth inhibiting agent that causes the circles. It is volatile, highly toxic and very slightly water soluble. Upon contact with light, air or heat (NIH data sheet, see references), it decomposes to carbon monoxide and a very pure elemental iron, called carbonyl iron because of its origin. Naudé et al. (2011) not only found CO inside the circles, they also found considerably more magnetic particles clinging to the magnetic stir bars used when preparing soil samples from inside the circles, than to those with soil from the matrix (see photos there). This points to the decomposition products of Fe(CO)5 and confirms the link to iron. Should it not be of magmatic origin like on other solar planets (Wetzel et al. 2013), iron pentacarbonyl can be formed by the reduction of Fe2O3 - of which there is plenty - to Fe and then reaction with CO, which is a volcanic gas. The reduction can either happen with CO as reducing agent (Fe2O3 + 3CO = 2Fe + 3CO2) or by anaerobic microbial action, which is a source of electrons when bacteria eat organic matter (Vepraskas, no year). Eicker et al. (1982) report more anaerobic than aerobic bacteria inside the circles. The lack of vesicular arbuscular mycorrhizae (VAM, a fungus) (Joubert, 2008; Naudé et al., 2011) also points to an anaerobic environment inside the circles. Reduction of Fe2O3 would lead reddish soil to turn more gray (Vepraskas, no year), as can be seen in the Onyuva Plain at https://goo.gl/maps/OVhLl . That the circles form a slight depression in the soil surface is usually attributed to wind erosion. I suggest that this is due to a higher water content inside the circles. If you spray a heap of dry soil with water, it will compact, as the water acts as a lubricant and adds weight. Albrecht et al. (2001) reported up to the five-fold water content in soil from the circles, compared to the matrix. In areas of less water availability, where the matrix is not uniformly covered with grasses, it can be seen in aerial imagery, that the circles sit in the center of patches of vegetation, or ″islands of moisture″. A few of these vegetated patches have no circles (Fig. 2), which means that not enough of the inhibiting agent is reaching the surface to form a circle. These islands of moisture confirm that the inhibiting agent is dissolved in water and has the highest concentration in the center. There, where most of the moisture is found, it is phyto-toxic and forms a circle. Outside of the circle, with less moisture (and a lesser concentration of the inhibiting agent), it is hypotoxic and the grasses remain unaffected. As I see it, these ″islands of moisture″, or even the circles in a uniform matrix, sit on top of a vertical column of greater water availability, which is the vector that carries the toxic iron pentacarbonyl to the surface, where it kills grasses and forms a circle. What maintains the circles is top soil evaporation (transpirational pull) that, aided by capillary forces, slowly draws the water column upward, and with it, fresh toxins. This upward movement in turn draws in ″groundwater″ horizontally, depleting the column's direct vicinity of water, thus preventing another water column nearby. This causes the equidistant pattern of the circles. Moll (unpublished but mentioned: see ref.) used ground penetrating radar to find what looked like a 'curtain' below the edge extending to as deep as 10 meters. This could be a phase boundary. If capillary forces are indeed a cause for the water rising to the surface (like trees transporting water to certain heights), then grain size of the soil must be considered a contributing factor. Then there is the edge-effect of taller perennial grasses that is often ringing the circles. These often show much more additional biomass than there would be if the circle was vegetated. So they are not growing taller simply because of the availability of more water due to lacking transpiration inside the circle (Van Rooyen et al., 2004). Imagine the column of water idealized as a vertical narrow cone or cylinder. On the cone walls water is evaporating horizontally outward into the drier soil atmosphere, in the process depositing a tiny amount of nutrients on the cone wall. These are very slowly carried upward with the overall movement of the column. The water vapors (gaseous H2O, vapor pressure 17.5 torr) are lighter than air according to Avogadro's Law (18g/22.4L) and are therefore rising to the surface to feed the grasses on the edge, together with the deposited nutrients that the cone wall may carry. What little iron pentacarbonyl is dissolved in the water also evaporates (vapor pressure 21 torr) into the drier soil atmosphere outside the water column. But its vapors weigh almost seven times that of air (196g/22.4L). They will sink and never reach surface plants. Solubility of iron pentacarbonyl in water is stated at 100 - 200 mg/L, depending on source. On ecotoxicity the NIH data sheet gives an EC50 for Scenedesmus subspicatus (Green algae; cell multiplication inhibition) at 150 mg/L/72 hr. And this may be killing the grasses in the circles. With increasingly less water, growth in the matrix will slowly disappear, beginning midway between the circles, leaving only the islands of moisture and then the rings, until these also die. With more atmospheric water the Fe(CO)5 will be diluted to sub-toxic levels and grasses will again grow in the circles. The whole phenomenon may be a delicate balance between a toxin and ″just not enough water″. Most of the above was taken from a collection of thoughts that I compiled in 2010. Albrecht, C.F., Joubert, J.J., De Rycke, P.H., 2001. Origin of the enigmatic, circular, barren patches ('Fairy Rings') of the pro-Namib. South African Journal of Science 97, 23-27. Jankowitz, W.J., Van Rooyen, M.W., Shaw, D., Kaumba, J.S., & Van Rooyen, N. (2008). 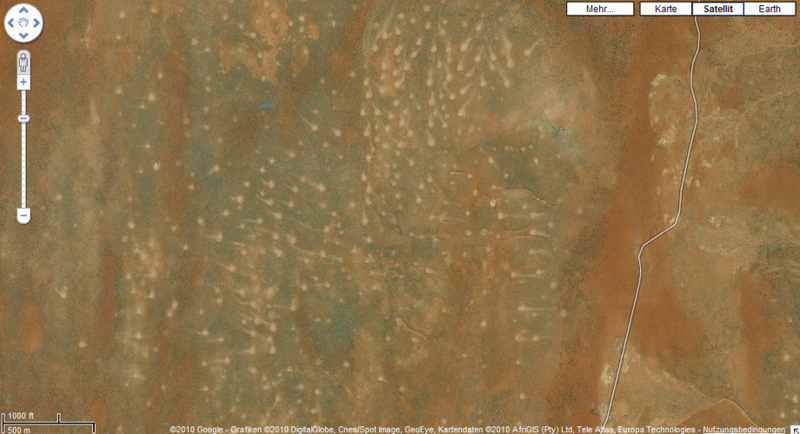 Mysterious circles in the Namib Desert. South African Journal of Botany, 74(2), 332-334. Joubert, A., 2008. 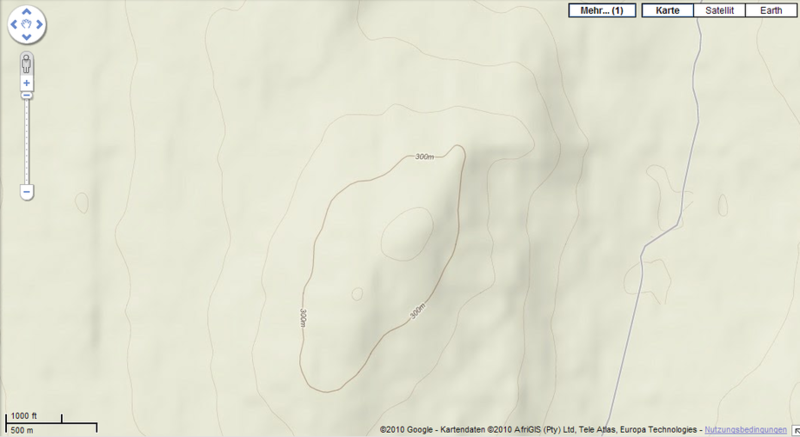 Investigation on Selected Bionic and Abiotic Factors in the Maintenance of the ″Fairy Circles″ (Barren Patches) of Southern Africa. M.Sc. Dissertation, University of Pretoria, Pretoria, South Africa. Naudé, Y., Van Rooyen, M.W., & Rohwer, E.R. (2011). Evidence for a geochemical origin of the mysterious circles in the Pro-Namib desert. Journal of Arid Environments, 75(5), 446-456. Van Rooyen, M.W., Theron, G.K., Van Rooyen, N., Jankowitz, W.J., Matthews, W.S., 2004. Mysterious circles in the Namib Desert: review of hypotheses on their origin. Journal of Arid Environments 57, 467-485. Wetzel, D.T., Rutherford, M.J., Jacobsen, S.D., Hauri, E.H., & Saal, A.E. (2013). Degassing of reduced carbon from planetary basalts. Proceedings of the National Academy of Sciences, 110(20), 8010-8013. Not far to the north-east is an area where there are circles except in a zone of very red soil. Just curious as to why. Another place to see the 'Islands of moisture' is in a small plain between Hartmann Valley and Marienfluss below. You won't see much there, as it is the wrong year. Zoom out to identify the location and then find it at Google Earth. Once there, set the time back to the date 12/3/2012. Using the slider, you can see different states of dryness. An unusual place to find strings of circles: right by the sea, 40 km north of Namibe, Southern Angola. - find proof of phytotoxicity of Fe (CO)5 - all I found was the link to said algae (cell multiplication inhibition), while toxicity to humans (mammals) is a given and widely mentioned. - find anything relating to the presence of Fe(CO)5 on earth's surface. Maybe some Dept. of Geology has other resources than general internet. But it seems to be formed in magma.